Gunug Agung has had impressive eruptions in the past week. So far, in spite of the publicity, the event has remained relatively minor. We do not know whether these are the initial rumblings and in the next weeks and months there will be far larger explosions, or that this suffices to relieve the pressure inside and allows the volcano to go back to sleep. For the local population the second option would be preferable by far! If the eruption intensifies, we also do not know what level it may reach. Based on statistics, smaller eruptions are far more likely than big ones, and Agung is therefore expected to behave. On the other hand, larger eruptions do occur and can never be fully excluded. And if the size reaches VEI6 or higher, the impacts can become global. But even then, it is the local people who suffer most. From Susan Loughlin, Sarah Brown, et al: Global volcanic hazards and risks, Cambridge University Press, 2015. Fatalities due volcanic eruptions. The red line is the full count, the blue line is without the 5 largest events and the purple line is without the 10 largest events. The figure (taken from the book ‘Global volcanic hazards and risks) shows why large eruptions are best avoided. It shows documented fatalities due to volcanic eruptions over the past 400 years. Obviously, the older the event, the less complete the record will be. The numbers are dominated by the largest events, and the largest events are dominated by two eruptions, both in Indonesia. These are also the two largest eruptions in Indonesia in recent centuries. It seems likely that past VEI6 or 7 events in Indonesia will also have had massive local impacts. Worldwide, every known VEI6 or 7 eruption since 1600 has resulted in fatalities. And Indonesia is particularly vulnerable: it is a densely populated country, with a high level of development going back millennia, and there is a tendency for people to live close to the most active volcanoes as that is where the land is most fertile. Nowadays, the volcano observatories in many countries do a marvellous job in saving lives. Most eruptions give warnings, through a variety of precursors. In the current decade, the most devastating eruption was from Merapi (also Indonesia!) in 2010, where over 380 people died. But almost half a million people were evacuated before the eruptions, and it as been estimated that this evacuation saved over 10,000 lives. The Indonesian authorities, guided by the volcanologists, avoided a catastrophe. The risk of eruptions depends not only on the particular volcano, but also on the nearby population. Taken both into account, Indonesia stands out as the country with by far the highest level of danger. It has been estimated that over 60% of the global threat to people from volcanoes comes from Indonesia. This is calculated from the number of active volcanoes, and the number of people living within 30 km of one. The second highest country, the Philippines, accounts for only 10%. Since 1950, 347 volcanoes are known to have erupted across the world. Before 1950, the records become rather less complete. Over the holocene, 886 volcanoes have had known eruptions. But even for the largest eruptions there are major gaps in our knowledge. It has been estimated that we do not know 85% of the largest holocene eruptions from before 1AD. This makes it difficult to derive eruption rates, and makes it tricky to estimate the likelihood of a VEI6 or 7 per century. The best current estimate is that a VEI6 eruptions happens once every 70 years. The number of VEI7+ eruptions is estimated in the same manner to be once every 3000 years, but that seems an underestimate. After all, there have been several such eruptions over the past 2000 years. And two of the largest three eruptions of the past millennium happened in Indonesia. Let’s take a quick look at the major eruptions we know about in Indonesia. This is a whirlwind tour, and is very very far from complete. In fact, only a few biggies are listed. This most famous of eruptions is also the smallest one considered here. The eruption volume was perhaps 20 km3, and it counts only as a VEI6. The death toll was still horrendous, because of the tsunamis which destroyed the nearby coasts. The pyroclastics flows added to the toll. The volcano has been busily rebuilding itself albeit not at exactly the same place. Anak Krakatau is trying to emulate its famous parent. Tambora, in 1815, was the most recent major eruption the world has experienced. The volcano is located on Sumbawa island, east of Lombok. The explosion had worldwide impacts, including the ‘year without summer’. The eruption volume was in excess of 100 km3; it left a caldera 7 kilometer across. Before the eruption, the mountain was one of the tallest in Indonesia, estimated at 4300 meter. Afterwards, it had been reduced to less than 3000 meters. This mountain on Lombok is the location of the disastrous 1257 eruption. There used to be a mountain here, Samalas, but it disappeared in this explosion leaving a caldera of 7 km diameter. It is claimed to be the largest explosion of the last 2000 years. 25 km away, the pyroclastic deposits are still over 30 meter thick. The volume is not well known but it likely to be around or close to 100 km3. The eruption had worldwide effects, including dry fogs in Europe, and the death of 20,000 people in distant London, caused by crop failures and famine. It may have been to blame for the decline of the Mongol empire. And in Indonesia, it destroyed a kingdom. Behind Agung, on Bali, lies a much less imposing mountain. And behind this mountain hides an elliptical caldera measuring 14 by 10 km in size. This is the site of another monstrous eruption. The ejecta, called the “Ubud Ignimbrite” covers an area of about 1200 km2. A later eruption, about 20,000 years ago, was four times smaller, and formed the current lake. Both large eruptions were dacitic. The Ubud ignmbrite, which comes from the earlier, larger eruption, has a volume of 84 km3. The full ejecta must have been more. Over time, a new dome has formed in the centre: it still erupts regularly. This is another remnant of a very large eruption. Ranau is a 14 km by 8km caldera, rectangular in shape, which is filled by Ranau lake. The caldera formed in an eruption that left its ejecta over a region at least 100 km long. The tuff in one area 50 km from Ranau is still several meters thick! Seminung Volcano has now grown up in the caldera, and is perhaps the reason why the remainder is rectangular. Prior, the caldera could have been as large as (perhaps) 20 by 20 km. However, it is also possible the caldera has been distorted over time by movement along the Sumatran fault and was a bit smaller than that. The eruption was rhyolitic. The total volume is not well known, but is certainly in excess of 100 km3 – possibly by a lot. This beautiful lake is located in the Padang Highlands, Sumatra, about 300 km to the south of Toba. The lake is 16 km by 7 km, and has a volume of 100 km3. The caldera is bit larger, 20 km by 8 km. There have been two eruptions here, where the first one formed the main caldera, and the second a few thousand years later enlarged the southern part of the caldera. The first eruption is the major one: it left its deposits over an area of 8500 km². The eruption produced a volume of 220–250 km³. The caldera formed over a fairly short period of time. There were a series of closely spaced pyroclastic flows and surge deposits, followed by three high volume lava flows going both east and west. It is too large to comprehend. The lake is 100 by 30 km in size, with a surface area of 1100 km2. The volume of water is a staggering 240 km3 which makes it larger than the Dead Sea. The eruption that caused this lake was equally staggering, the largest known on Earth in the last 2 million years. The volcano that was responsible had had several big eruptions before, but the final one blew everything away. It erupted 2800 km3 although much of this was not explosive. The lava flows reached both oceans! The flows and ejecta cover an area of more than 20,000 km2 with a typical thickness of 50 meter. The explosive phase, producing ash, lasted around one week and produced 800 km3. That is 100 km3 per day! The effusive phase may have lasted longer. It is hard to believe that anything in this part of Indonesia was left alive. Eruptions like Toba are very rare, and they may only occur once per million year or longer. It is perhaps a midway point between a major eruption and a flood basalt. No worries. Huge eruptions, of the size of Maninjau or similar, seem to happen here perhaps every 20 thousand years in Indonesia. The ones we know about are all on Sumatra: that island seems particularly prone to caldera formation. Smaller eruptions, say the common-garden VEI7 variety, happen here as often as once every 500 to 1000 years. They tend to occur further east, towards Lombok. VEI6’s, like Krakatoa, can probably occur anywhere and anytime. They happen in Indonesia once every few hundred years at least and perhaps more often. The lakes left by the largest caldera forming eruptions can last a very long time. These eruptions destroy the magma chambers that feed them and no new volcano will form: there may be rebound which fills in the central part of the caldera, but this is not volcanic in itself and new volcanoes will more likely form further along. The longevity means that we may know most of these calderas. No other Toba-sized eruption has happened on Sumatra over the past million years: we would have known. But smaller eruptions, say Tambora-sized, appear not to leave lasting scars, or we would see them everywhere. The magma chambers survive these blasts, and over time a new volcano grows and fill the caldera. This may happen within a few thousand years. The new mountain may not erupt as massively as its progenitor: there is no guarantee that VEI7’s put in repeat performance. But in Indonesia, anything is possible. Very smooth eruption so far. Will it cool down now or is Agung preparing for a fireworks show? And SO2 data from Nov 27. 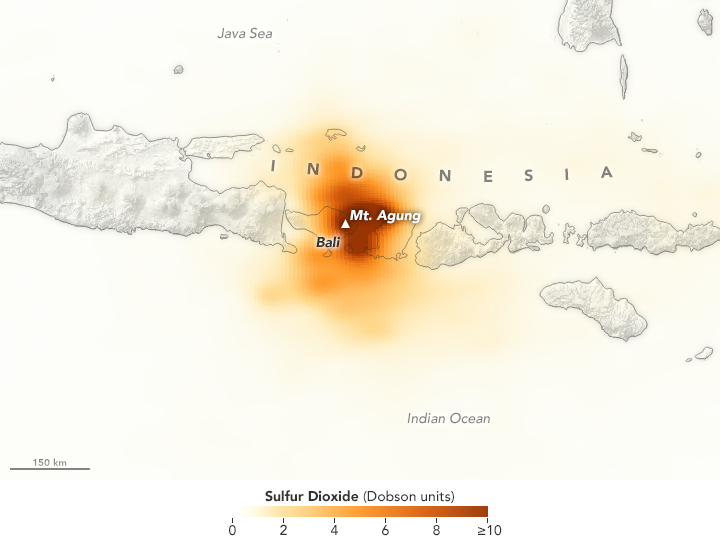 The next day, the SO2 disappeared as Agung switched off – for now. Regarding bewildering direction of the two ash clouds… could it also be one cloud split by two strata of air currents?? Yes, because i’ve seen Redoubt do that… good catch. Is something going on ? From 21:30 does the graph show that magma is breaking rocks ? Not sure what that shows, but those shakes are regular, apparently close/shallow, and reasonably consistent – and weren’t there until after the last strong harmonic tremor episode. Let’s see if I’m out of the dungeon. I stumbled across this 169 page piece about Jökulhlaups and Öraefajökull on the IMO webpage. Not sure it has been shared here before. I haven’t read it yet, but it looks quite interesting. Chapter VII. “Öræfajökull: Evacuation time modelling of areas prone to volcanogenic floods” is a quite scary read. It compares the time required for evacuation with the time it takes before the main road to becomes flooded. The conclusion is that the time for evacuation exceeds the time for flooding, which is why the published emergency evacuation routes lead to “safe” points inside the area. As Mount Agung continues to spew dark ash into the skies, a new threat has emerged on the Indonesian island of Halmahera. A notice issued by the Volcanic Ash Advisory Center Darwin (VAAC) has warned that the spewing Dukono volcano is erupting on the island. VAAC said in a statement: “Volcanic ash unidentifiable on satellite imagery due to met cloud and darkness, however, volcanic ash still expected in area. Ash cloud maps issued by VAAC forecast the ash cloud to head east towards the island’s east coast. Oh no! 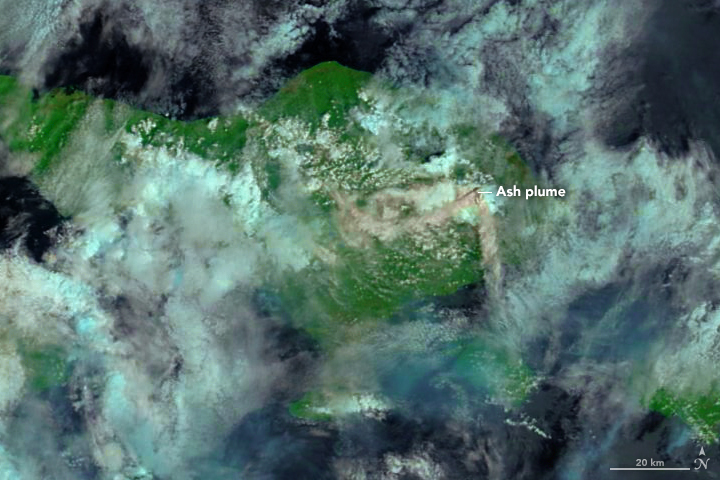 Not another small ash plume from a volcano that has been in a state of constant eruption since 1933! Pretty much. The amazing item about it that I see, is that it’s column is so low, that it broke my spreadsheet. I’m gonna have to go back through Mastin et al to see why I’m showing what numerically results in negative mass flow. There has to be something wrong in my spreadsheet. The disheartening bit is that it has performed so well through so many eruptions. Why did it croak now? Ha! Found it!. I did a quick look at the diminutive plume height and didn’t compensate for the fact that it has a lower edifice height. The Mastin formula is specifically designed for the height above the edifice. Dukono is currently ejecting at 0.02 m³/s. Roughly the same as Agung is currently doing. Essentially, it’s like someone is up on the summit frantically throwing small boxes of rock dust up into the sky… poorly. I am writing this to show that I am logged in via IE for Hobbes benefication. Complete with return key stroke. Darwin Ash Advisory has been terminated for Agung now. All ash dissipated for now. If it holds, that puts this eruptive episode at about 1.1823306 x 10 7 cubic meters DRE, not including magma extruded into the crater. Opinion: Now it gets dangerous. If the extruded magma in the crater solidifies, it will act as a fairly large blockage that has to be cleared if the pressure builds. Colicky babies are never happy about it. There has been steam, relatively heavy at times, since first light. Nothing there now. But even when it was there, it didn’t seem to be driven by any pressure. There is new tremor. The real stuff, not the afternoon rains (not sure what the overload signals are, but it is not normal volcanic tremor). Two more earthquakes between 11:30 and 11:45 . Yes, I saw that. But I am not sure I accept it! This ‘over scale;’ signal is too different from the normal tremor, and the amplitude is much larger than the usual tremor. (‘over scale’ is a funny term to use for what is just saturation). The seismometer may be placed on top of the vent in question but I doubt it. Something rain-related seems more likely (rain on lava?). The ‘over scale’ has not happened in the last 24 hours, and indeed the weather station (not particularly close!) has kept things dry, apart from some light rain that started recently. Looking at the seismograph signal, it has started this funny signal, but much weaker than before. (And looking at it you can see how different it tis from the volcanic tremor earlier – it is much smoother.) It almost looks like light rain.. I may be completely wrong on this suspicion though! No, your not. “overscale” is just a pretty silly way to state saturation. In my experience, saturation leads to clipping, and signal fidelity is lost. I mentioned several days back that what I expected from the seismo when things went into “game on” that the tremor signal would ramp up and begin clipping. This is pretty much what is sort of hinted at by the “overscale” statement. Now, if they knocked the gain back so that they no longer had clipping, and called that the “overscale” setting, I might buy the use of the term in this context. Other than that, it doens’t make a lot of sense. “Overscale” may just mean “low gain” mode for the seismo. I have two accelerometers here, one, an X-2, and the other, and x-16. The X-2 saturates at 2 g acceleration, the x-16 at 16 g. I’ve done the “thump the ground” test with each using a 20 kg mass dropped one meter. The X-2 can register the negative “first motion” of the impact. (tension). The X-16 cannot because it doesn’t have the needed sensitivity. (both accelerometers were 10 meters from the impact point) Soil type – damp sand. It is Florida after all. I have thought about getting a second X-2 and doing trace stacking to see if I have any underground structures that I need to worry about. The odds of me locating a potential sink-hole are slim since the nearest karst topology is over at Defuniak Springs. (The Port St Joe transform fault has fractured the underlying limestone formations and caused cavity formations.) That’s what lake Defuniak is, an old water filled sink hole almost completely circular. Summer here is where it gets insane. Black flag (no regimented athletics) commonly happens shortly after sunrise when the heat stress goes above 100 F.
Fontur is the peak of the Langanes peninsula, in East Iceland. “65-feet-tall storm surge”… err… do you have any idea of how intense a storm would have to be to generate that sort of surge? Camile did 25+ feet but the structure of the coast augmented the lifting of the water. At 65 feet, even the specialist big wave surfers would be headed for higher ground. And if even they aren’t stupid enough to wax up their boards and hit the coast…..? A 65 ft storm surge sounds..what…Apocalyptic? I looked in on the Agung seismo just now, and from what I can see I am of the opinion the eruption is not over. To me that looks like some rock-breaking under pressure, followed by deep magma movement. Now, we’ve seen a good ashy de-gassing event that has depleted gas from the upper levels of magma penetration into the edifice. But I’d guess from the seismo that newer gas-rich magma is pushing up the conduits. Being more buoyant than the depleted magma, when it comes through we might see some explosive events with lava bombs and potential lava flows as the exhausted magma is blown out. Hopefully no pyroclastics. Well, that’s just a thought. Chunks of glowing andesite hurled at me with loud “boos” always welcome! The alert level is still IV (AWAS) so a few experts think that is still a high risk. OTH the experts are probably worried about pyroclastic flows, lahars, etc. Anyone know if Agung has a lava dome? Last I heard was on this site, quoting PVMBG saying that the crater was approx 30% filled with new lava. Even last night there were odd moments where a glow from the crater was (dimly) visible, so I would imagine this might be at least partially molten. With a drop off in activity I would assume a drone pass would be on the cards if the weather allows. Hopefully the EQ’s are settlement from deflation but unfortunately i suspect that this wishful thinking on my part. I agree with Albert wrt the quirky nature of the overscale tremor signal, but as to it’s cause – this can only be guesswork on our part. The official announcements, confirming volcanic tremor, are based on analysis of portfolio of data from various monitoring stations. We however have just the one publicly available drum plot, we therefore have to acknowledge that what we are seeing on this could be a coincidental local signal. The Bali seismo shows what seems like a swarm of quakes and periods of off-scale tremors which might suggest vigorous lava upflow. I do wish we could see the location and depth of those quakes. Could these be offshore, somewhere to the north or south? The earthquake activity itself actually looks quite similar to the events before the eruption itself, did something plug up and is the magma searching alternate pathways? Yeah indeed…. New pulse of magma, which has basically a straight free path to the surface. This may be it……. Short but interesting article from the UK Independent: http://www.independent.co.uk/news/world/asia/bali-mount-agung-volcano-indonesia-island-eruption-explosion-latest-a8089216.html . About 2-3 minutes after quake at 3.44 Bali time, a small cloud popped out above the Agung. The earthquake at 03:45 Bali time could it be this kind of one quoted below . It has low frequency signature. Below is comparison with spectogram taken during the 4 october. Intuitively, we can infer that the whole mountain is now vibrating, so there is “stuff” going on inside…. Is it settling back to a quiet state, or is it busy preparing the next round of fireworks? That what is causing eruption explosibility, is magma fragmentation. So many factors impact on that. Magma viscocity, pressure gradient. It is not that mountain is vibrating inside and “stuff” is going. Is there something white and glowing in the centre of the volcano about a third of the way down ? This may be nothing, but yesterday, the steam plume seemed more easily visible at first light with a low sun. This morning is different. It is only currently visible on the Rendang camera (the more distant view) due to local conditions, but it has definitely become much more vigorous over the last hour, and the plume seems discoloured. Both the plume and the area downwind of it seemed to have a yellow-green tinge as the sun came up. And update on the potential future of Gunung Agung!